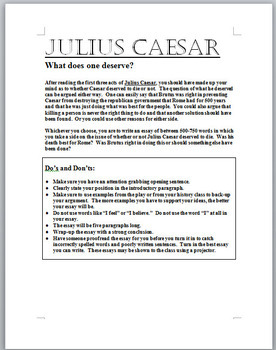 This is a complete lesson to not only show students how to write a simple five paragraph essay, but also to think a bit more deeply about one of the key issues raised in Julius Caesar by William Shakespeare. 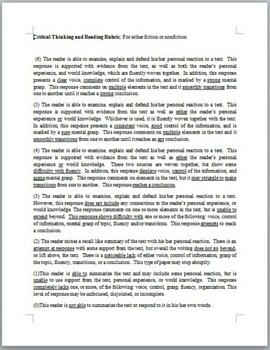 1) a PowerPoint presentation explaining the five paragraph essay format with examples. 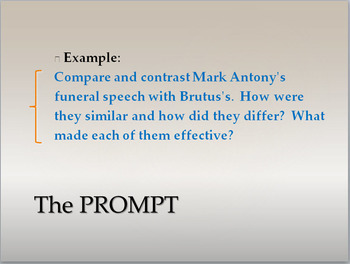 2) a detailed writing assignment with a thought-provoking prompt for the students to work with on their own. 3) a rubric for grading the essays. 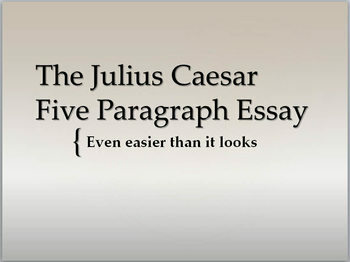 I use this with my own students after we have read the first three acts of Julius Caesar, though you could modify it for writing anytime after Caesar's death.